online video training program is a great bargin! The course covers all subjects taught in Thermwood’s week long eCabinet Systems Training Program without the travel and lodging costs. "I didn't know eCabinet's could do that!" "Each video clip alone was worth the price." "I have to say these videos are superb. Whether you are a veteran or a newbie to eCabs, they provide a clear understanding of eCabs functionality and features. What a great reference to have at your fingertips." "These videos are a fantastic bargain and really allow you to unleash the power of eCabinets." 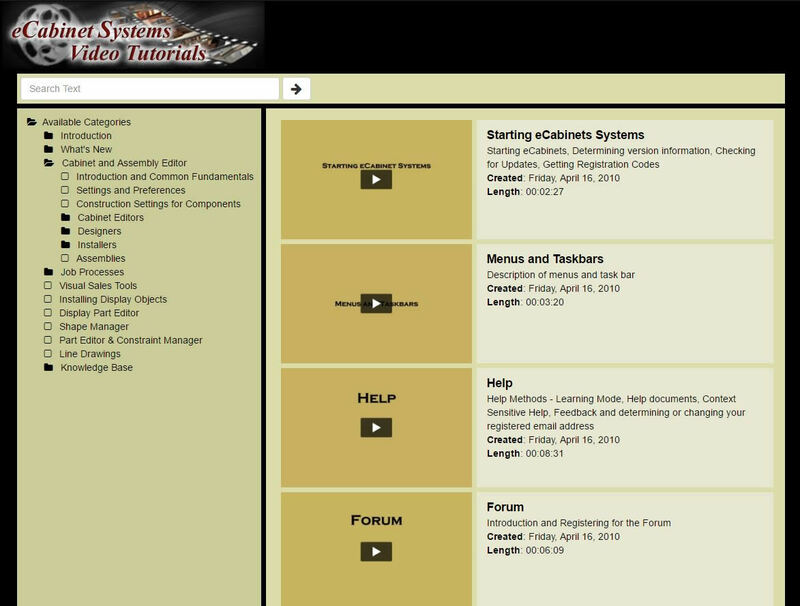 Click here to preview the online training site! All functionality will work (search, browse, etc. ), except that the videos will not play without first subscribing. You’ll create an account with Vimeo and subscribe using your preferred payment method. That is all done through Vimeo’s program and does not rely on any human interaction allowing you to begin watching videos immediately. 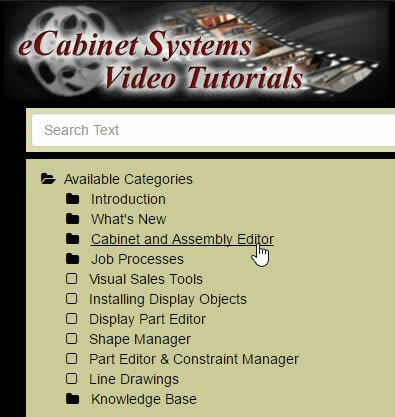 You'll can access your videos by making selections from an interactive Table of Contents. Click on a Category. Categories are like Chapter titles. And then, categories may be divided into sub-categories. 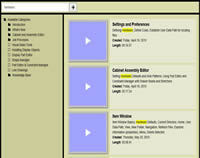 At the Category or Sub-Category level, a directory of video files will be listed. Review the video names and description, then choose the one you want to watch. Just that simple. Enter a search string, such as "hardware", then click Search. 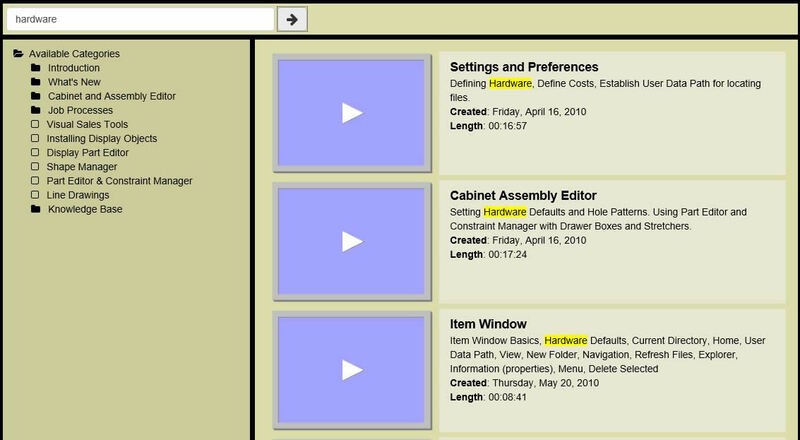 All the videos that have the word "hardware" in the title, the desciption, or a hidden key word field will be listed in the directory. This is an extensive, detailed course with over 25 hours of content that will guide you through every function and capability of this extraordinary software. It is presented in clear, easy to understand language that will help you unleash the incredible power of eCabinet Systems. You can view the videos not only on your computer, but also your mobile devices as well as your tv that is connected to the internet. Once you create your account and log in credentials, you can share this with your employees. Get them up to speed with the goal of improved productivity. You or your employees can view the videos anywhere you or they have an internet connection. Remember many of these videos are short and probably much easier to squeeze in than exercise. The price is still "just" $25 per month. The date that you subscribe is your anniversary date and expiration date. When you subscribe with Vimeo, they will charge your card each month on that anniversary date automatically. No muss; no fuss. Couldn't be any easier! When you want to stop, simply end your subscription with Vimeo. All-in-all, try out the video tutorials. It's inexpensive, comprehensive and you do it on your timetable.